Home Bangalore Up for a game? Therea��s a new networking app in town for serious sports enthusiasts, and ita��s called Spyn. It lets users discover sportspersons around them, connect, and get down on the field. But wait, therea��s more. 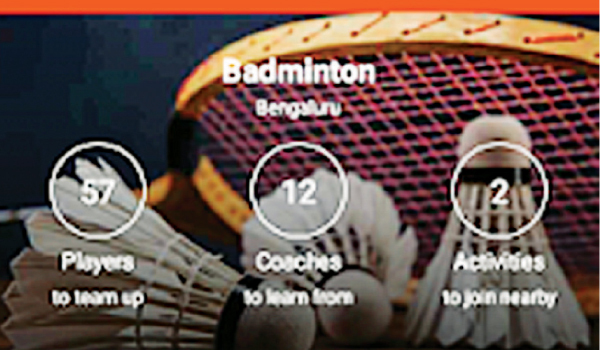 You can even get in touch with coaches and instructors, keep a tab on tournaments in Bengaluru, or simply get together to host matches. Therea��s also a list of sports clubs and academies that you can book for games. The good news is that in just two months ita��s received thumbs-up from the likes of Mekhala Subedar (a four-time national squash champion), Sujith Bijjahalli Somasundar (former Indian cricketer), and BN Sudhakar (renowned badminton coach). It currently has more than 500 users, 200 sports facilities, clubs and academies as well as 100 coaches on board. This Android app is the coming together of three avid sports lovers a�� brothers Nayan and Sudarshan Karnavat, and Ravindra Kumar. And their motto is to help you a�?play more and play bettera��. While Sudarshan likes cricket and everything related to fitness, his younger sibling Nayan is a passionate squash player and Kumar, his batchmate from IIM-A, is an avid badminton player. The trio began working on the idea in March last year. What is Spyn trying to achieve in a sector (read: sports) that is so unorgansied in the country? Co-founder Kumar, who looks after the marketing, says, a�?The process of playing a sport requires a few basic things. First, finding a compatible player; second, scheduling a game. Third, finding a court to play on, and finally, booking the court. Spyn lets you do all this, and book tournaments and workshops.a�? In the coming months, the app will also let you review players, coaches, clubs and even academies. Howzattt? ?